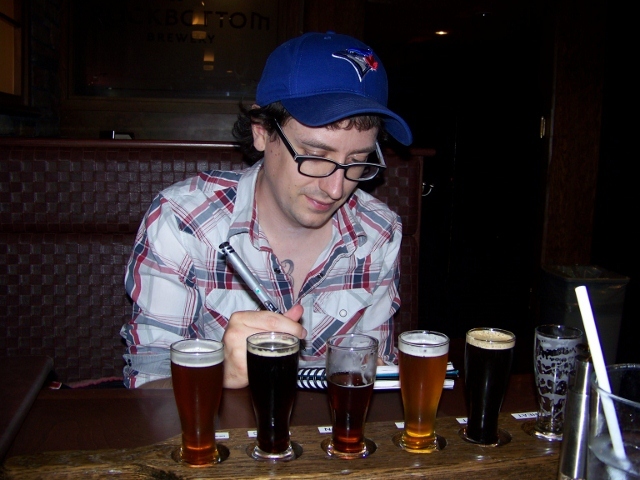 Atlantic Canada Beer Blogger (ACBB): Tell me about your blog and why you decided to start one. Beer Maven (BM): I started blogging about beer about two and a half years ago. I started off collecting bottle caps for one of my younger cousins but in the process of drinking a wide assortment of beers for their bottle caps I started to realize that were lots of wildly different kinds of beers and lots of them were really good so I started writing down some descriptions and decided to put a couple descriptions up on the web. Like most new bloggers, I pretty much forgot about my blog after two posts but, following an eye-opening three days in Brussels, I soon decided to fire up the old beer blog again. I was living in Norway at the time and saw it as a way of sharing with my friends and family back in Canada the cool Norwegian beers that I had come across. Now I post reviews of beers brewed by everyone from mega to micro-breweries from all over the world at least twice a week (sometimes more). I have taken a shine to reviewing brewpubs I visit and their often fantastic sample trays so they are often the focus of a post. My goal is to provide a vicarious beer experience so people can make informed decisions about whether they would appreciate a beer before they actually buy it. When reviewing a beer I do my best to understand it through the lens of what the brewmaster was trying to accomplish rather than my own personal preferences. I have nearly one-hundred posts up and more than one hundred unpublished reviews waiting on my computer and my blog has been visited by beer enthusiasts from 106 different countries. ACBB: How did you develop your interest and knowledge of beer? BM: My go to reference book is Tasting Beer by Randy Mosher but I also use Michael Jackson’s Beer Companion. By and large, my knowledge of beer and brewing has been as a result of a large number of public and private brewery tours of the years, a private tour of a Canada Malting plant, brewery websites for terminology and conversations with countless other beer geeks. As far as developing my interest: I think three days in Brussels will pique most people’s interest in beer. ACBB: Do you have any interesting or unusual experiences related to your blog or beer tastings? BM: A marketing rep for Molson contacted me through Twitter and sent me a pair of cans of Rickard’s Blonde to review which was pretty cool. But the most rewarding beer blog experiences I’ve had are when a reader emails me or leaves a comment that my review helped them appreciate a beer or make a decision about whether or not to try a new beer. ACBB: Have you ever gotten into homebrewing? BM: I do make homebrew now and then but for the moment am only using off-the-shelf kits from my local brewing store (www.splendidgrapes.com). A friend of mine started growing hops this summer so by next summer I hope to be able to add some fresh hops to ‘spruce’ up the kits; pun intended. ACBB: What are some of your all-time favourite beers? BM: My all-time favourites include Garrison Spruce Beer, Maredsous Brune and Esrum Kloster by Skands. Hacker-Pschorr’s Hefe Weisse, Gahan House’s 1772 IPA, La Fin du Monde by Unibroue and Lagunitas’s Hop Stoopid are some of my current favourites. ACBB: What are some of your preferred styles of beer? BM: Belgian and especially Trappist ales, wheat beers, IPAs are probably my favourite styles but I enjoy just about any kind of beer. ACBB: Where do you get some of the more exotic beers that you review that aren’t available locally? BM: Local options for exotic beers not available at NB Liquor that I frequent are Marky’s Laundromat Bar in Moncton and Premier Wine and Spirits in Halifax but other than those two places I make a point to look up breweries and beer stores whenever travelling. Also, I’m lucky to have some great friends and family members that often bring me hard to find beers when they visit or return from travels. ACBB: Do you have a favourite brewery? BM: Really hard to pick just one but I’ve been impressed by everything I’ve tried from Lagunitas though there are plenty of fantastic breweries out there and right here in Atlantic Canada. I really like the Pump House Brewery in Moncton, Sea Level Brewing in Port Williams, Gahan House in Charlottetown and Propeller, Garrison and Rock Bottom in Halifax all make great beer. With the craft beer revolution still going strong, it is a great time to be a fan of beer. ACBB: Are there any beers that you refuse to try again? BM: Schnitzer Brau. I’m pretty sure “Gluten free and terrible” could be their motto. ACBB: What is the best time to sample a new beer? Do you have any particular habits during your tastings? BM: I personally think the best time to sample a beer is in mid-afternoon and when I am hungry because I feel like that way my tongue naturally seeks out the different flavours and complexity. Also, being hungry lets me see the flavours in the best possible light and guarantees my palate will be clear. Usually when I review a beer I’m sitting in front of my computer with the beer, my reference books and usually an INAO Official wine tasting glass or a Weissebier “Vase”. After I’ve formed my own impressions of the beer and written my review I often share a drink and ask my girlfriend (@KTara691) her opinion and read my review to her. She acts as my sounding board and does a good job of keeping my reviews grounded so that they don’t get too esoteric and so they don’t fail to mention any flavours that I might fail to mention for being too obvious. ACBB: What are your beer related plans for the rest of 2012? BM: For the first time I’m headed to the Sea Port Beerfest in a few days and am getting really excited about that. ( Editor’s note: I received the info prior to the festival but only posted it afterwards). I’ll be spending the last half of August on vacation in Southern Ontario and while I’m there I’ll be searching through beer stores collecting as many craft beers as possible to bring home and review over the next few months. I’m also looking forward to trying some of the top rated Belgian beers as I work my way through that section of Premier Wine & Spirits. One other thing I’m really excited about is a project that is really a spinoff of my beer blog. A local restaurant (Pickle’s European Deli) and I have partnered up to do a handful of guided beer tasting evenings. We already did one and plan to do another in September. If the interest is there it’s something we would like to continue doing every month or so. I’ve been doing these for friends and family as preparation for the paid events and am hoping to do more of these intimate tastings for groups of 4 or 5 in people’s homes. As for the rest of the year and part of 2013, I’m planning to start pursuing some more formal training and certification in beer tasting. Also I am registered in a university level chemistry course with an eye for potentially entering a brewing sciences program in the future.